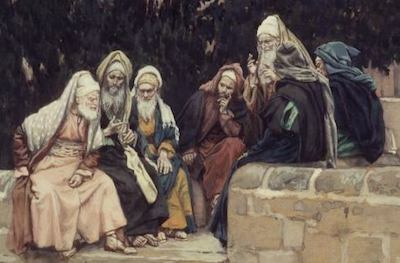 Are we modern day Pharisees? Seriously, we ought to consider that question. How do we judge one another? And should we? How do we judge those outside? Do we ever look at a person and believe (in our heart whether we admit it or not) that they are beyond help? Do we sometimes try to convert people’s way of life before we point them to Christ? If we answer “yes” to any of these questions, we have at least a bit of Phariseeism looming inside all of us. The Pharisees saw religion as the way to God. The believed if you conformed to all of the external religious instructions, then you were assured eternal life. Yet, Jesus clearly said that they had “neglected the weightier matters of the law: Justice and mercy and faith”. They were doing little more than teaching a salvation by works. And if we are not careful, we will do the same. Firstly, why do you believe you are going to Heaven? This is not a small question and there are not varied acceptable answers. The only correct answer here is, “I believe that Jesus died for my sins and that He rose again for my justification and that He is alive today”. Obviously, the wording can vary. But, the foundation of that answer stands sure and is supported by a plethora of Scripture. But what is the common answer these days? We may well hear somebody say, “I prayed the sinner’s prayer”. What sinner’s prayer? Surprisingly, we see no example of that in the Bible. Or, “I joined the church”. And yet the Scripture is clear that Judas was part of Christ’s inner group for some 3 ½ years and certainly was a devil from the beginning (John 6:70). And again, one may say, “I was baptized”. But clearly, the house of Cornelius was saved prior to baptism (Acts 10:44-48). Many varied answers could be given, but only one will suffice – “In Christ Alone I am saved”. But, do we often give the lost the wrong idea both by our own words and by our actions? What of this “everybody close their eyes and bow their heads” propaganda today? If the Spirit is at work, do we honestly believe we will stop His movement if eyes are open? And what are we truly teaching Spirit led seekers – that it’s OK to be ashamed of Christ? Jesus warned against such a thing numerous times. What of this “repeat this prayer” normality today? Would we not be better to stick with Scriptural practices? Shouldn’t we just point folks to “repent and believe” which is the common theme from both Jesus and the early churches? Help us get back to the Bible. Help us point people to Jesus and leave the external religion out of it. Help us point people to trust in Christ alone (Ephesians 1:13)…not external religion. Watering the Tulips is brought to you by Sovereign Grace Baptist Church in Northport. Please visitwww.sovereigngrace.net for more information. “Your App to the Gospel” is available in iTunes, Google Play and the Windows Phone Marketplace. Please download it today!